I’d like the French manicure and some … fake fingertips? This is Sandra Tsing Loh with the Loh Down on Science, and a new material with feeling. Literally! Meet Jonghwa Park, from Korea’s Ulsan National Institute of Science and Technology. He and fellow engineers fabricated a special film out of plastic and graphene. It’s an electronic skin, or e-skin. The plastic gives it flex. The graphene? It conducts electrical signals. Like nerves do. But it also generates such signals when exposed to a change in temperature. To top the faux skin off? They added fingerprint-like ridges to the surface. See, fingerprints do more than fight crime. They amplify and shuttle the slightest vibrations to receptors. This is why we can feel minute differences in texture. Like between glass and plastic. Their e-skins sense heat, cold, touch. 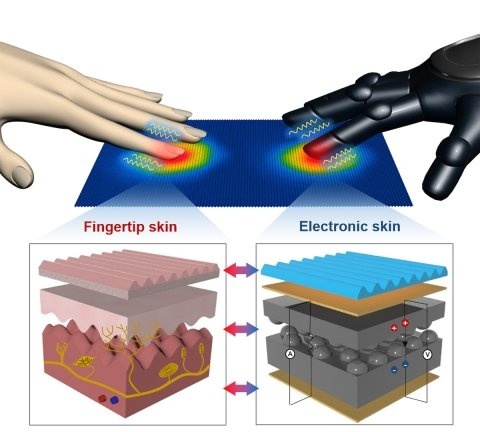 In tests, the e-skins detected water droplets of different temperatures, and the weight of a single human hair! The films could lead to new hearing aids … pulse monitors … Even sensitive robot nannies that feel the warmth of your baby … cradled in their bloodless, graphene hands? Fantastic!